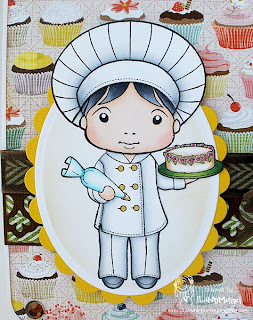 La-La Land Crafts Inspiration and Tutorial Blog: Move over Chef Marci . . . Someone new is taking over the bakery! Move over Chef Marci . . . Someone new is taking over the bakery! Well, well, 1LuvnMama is back with a La-La Land Crafts post. My son, along with the rest of the Kindergartners at his school, performed in a play/musical . . . Jack & the Beanstalk. He was a cook. My card that I'm sharing today was inspired by my son's performance. I used Chef Marci & Amour Luka. How did I use both images? I altered the two images - - I wanted the chef's outfit without Marci's face/hair. Amour Luka was the perfect fit with his long pants. This is how it came out! Well, my boy made me proud! He had me beaming from ear to ear after watching him perform. I hope this inspires you to create . . . have a great weekend! 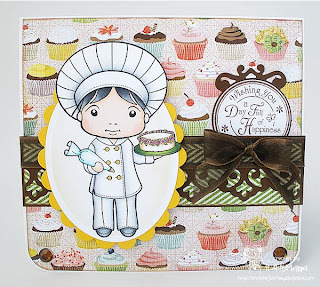 Oh..I love how you made the stampe into a boy chef!! So adorable! !